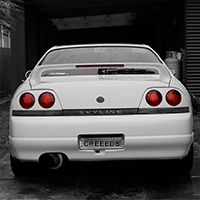 Anyone got or know of any R33 s1 front bumpers for sale. Needs to be white. Please let me know ta. Canon Lenses to film Drifting? Hey, Just after a few opinions on what type of lense I should get to film a drift event which is coming up soon. I do have a budget unfortunately which will be max $900 for a lense. I'm going to be reasonably close so I was thinking of something around the 300mm mark? Any suggestions? Cheers. Hey, Thought I might post up my 33. One of the cleaner skylines I've seen. All stock atm though, except the rims and exhaust.